I ordered this adorable fabric on Etsy, and couldn't wait to make some goodies with it! I only worked half a day at work yesterday (which is pretty much the greatest thing in all of humanity) and was able to get home early to work on some projects. I've had a few requests for items such as iPod cases, iPhone cases and such, and figured that I should probably get to working out some sort of a pattern. And a few hours (and a few episodes of Intervention) later (what is it with me and that depressing show?) I came up with a few things I'm quite happy with. I must admit, I'm a little weird when it comes to learning how to use things. I like to figure things out on my own, in my own way. I hate reading directions and patterns and manuals. For some reason, I feel like I'm back in school or something, which is just irritating. And half the time I read directions for something, I end up wanting to verbally abuse the pages. "What does this MEAN? Stupid words on a stupid page. I THINK I HATE YOU." Most everything I've learned about photography, coding for my blog, Photoshop Elements and most of my crafting, has come from just sitting down and playing around with it. Or researching it online. I'm not sure if that means I've ever doing anything the way it's actually supposed to be done, but...oh, well. It works for me. Having said that, I was getting seriously frustrated with my sewing machine yesterday. 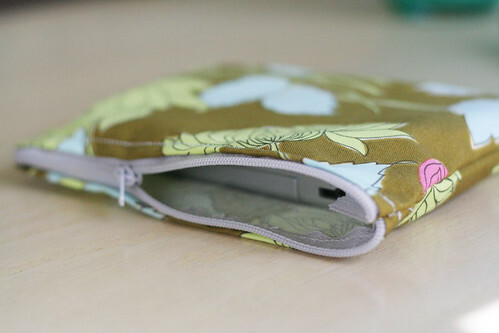 As you can see from the first photo, I made a little zippy pocket for my new DS. (I'm pretty sure "zippy pocket" is the correct definition, right?) 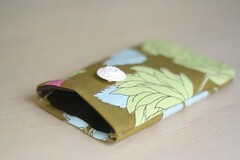 Of course, it was actually supposed to be a little zippy pocket to sell in the shop, but I couldn't get the seams right. It was my first time sewing something like that, but still. Anyone want to come over and show me how to sew perfect seams? Or teach me how to understand a sewing pattern without my head exploding? Or show me how to find the happy balance between entirely-too-slow and OMG THIS IS WAY TOO FAST when I'm pressing down on the pedal? The top two are photos of an iPod cozy. Yes, I still have an iPod Mini. Yes, it is totally in the process of dying a slow and painful death and I purposely leave it in my car overnight hoping someone will steal it, so I'll have an excuse to buy a new one without feeling guilty. (I'm not kidding.) 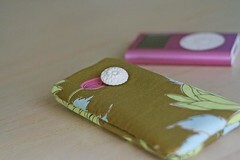 The bottom two are photos of a cozy that will fit either an iPhone or an iPod Touch. No, I'm not cool enough to have either of these things, hence the lack of the actual item in the photo. I'm really happy with how they came out, though! I have a bunch of fabric bits and felt bits (the inside of each are lined with felt) and am hoping to have a bunch made up for the shop within the next month-or-so. Of course, I'm going to be on vacation for two weeks this month (cue: happy dance, which may or may not involve raptor-like screeching), so I'm not sure how much I want to put in the shop while I'm away. I guess we'll see. 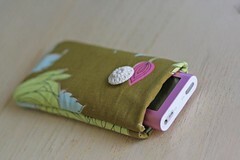 I am so happy I bought that iPod touch cozy, it is so adorable, and made by you so I know I'll love it! man, i've been looking for something to keep my ds in since i got it back in december! but i also need something with little pockets inside for the extra game cards so i don't have to carry those big containers around. you're so creative! Wow, love it! I want one and will buy one when my blackberry comes in since it is a phone I'll want to take care of and not just throw into my bottomless purse. Neat pattern! I think you have the bestest taste in material ever! I wish I could channel your creativeness into my own crafting world! adorableeee!! can i put in a request for a pink iphone cozy? because that would totally make my LIFE. you're so dang crafty... i'm jealous. OMG, this is so cute! I just got rid of my pink IPod mini, too...it died, and my sweet boyfriend got me a new shuffle. It's pretty sweet, though probably too small to require a cozy. If you make a cozy for a Samsung BlackJack, I'm all over. Your creations are adorable! I need one of those for my iphone. It gets a bit battered even with it's silicone case. I so need a iPod cover. Going to check it out now! Love those! I have a Nano still but my brother got an iTouch last sumemr and I've been totally jealous ever since! Lucky lucky to have 2 weeks vacation coming up! Omg I am exactly the same way. When I get a new cell phone, I toss the instructional manuel. Same with anything on my computer. It makes my dad CRAZY! i love how creative you are!!! I would totally use that for my iPhone! :) Really pretty! IF I had an ipod, iphone, itouch, or ds, I would be ALL over your stuff. You did say that you haven't sewn much right? I have tried many projects on my machine just wingin' it and they were AWFUL! So jealous of your talent! I have the same pink iPod mini! Unfortunately, mine is still going strong so I cannot bring myself to replace it! Love the new fabric. It's very cute. Okay, you're the funniest person alive. Raptor-like screeching? HAHA! I had the same pink mini, but the battery on it is pretty much dead, so I've upgraded since. I can't wait to buy an iPod cozy! :) I wish I were creative. iPod mini high five! Still have a green one. 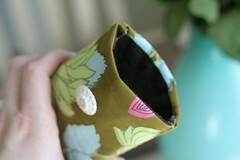 I have also been self-teaching myself to sew.. you're doing a great job! I love the stuff in your shop your so creative! I understand your frustration completely! As for learning to sew, I've never followed a true pattern, but I learned most of my sewing abilities by trial and error and craftster.org. People post a lot of how-to's which can help you figure out how things go together so you can design your own things later! I love that fabric :) I think my DS needs a new home. Her (yes, it's a her. . . she's pink after all) Hello Kitty bag is getting a little dingy. But! It all works out in the end. You and your sewing machine will get into the groove with each other and you'll be a master before you know it! If you take your old iPod into the Apple store they do a recycling program where you get ten percent off a new one. You just hand over the old one, tell them the size and color of the new one and they punch in ten percent off. Plus, if the company you work for (like an airline or Disney) is on the list you get six percent off as well. The recycling discount is the only stackable discount. Rethink that iPod stealing thing girl- because after you pay to have your car window fixed, you won't be able to afford a new iPod, haha. 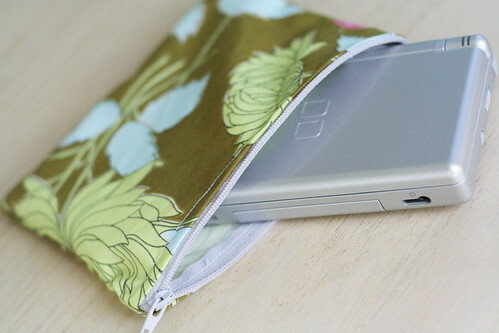 wow, i need a zippy pocket for my DS!